My transition from Laos to Vietnam was marked by noise. It was faint at first but after an hour the soundtrack of the Vietnamese highway was reaching its crescendo. The beat which kept the tempo was the car horn. Whereas Laos was quiet, sleepy, idyllic; Vietnam was loud and brash even in the smallest villages that we drove through on our 24hr journey to Hanoi. Thankfully the journey was nowhere near as bad as the blogs I read titled “The bus ride to hell.” The only tense point being the crossing of the actual border at 6:30am in a dense fog. We were I dropped off in Hanoi at the southern bus station. Bonded by our journey we banded together so we wouldn’t get ripped off by the taxis circling around us like vultures. They tried to charge us double the price to head into the center of town but I haggled down so we only got ripped off by 25% instead of 100%. I was only in Hanoi for 2 days before I headed south. My first stop was Ninh Binh Province, I was going on a tour organized by Vietnam Backpackers to save myself time and hassle since I had a tight two week window before I needed to be back in Hanoi. We arrived at the ancient capital of Vietnam- Hoa Lu to see some of the old monuments to the Le Dynasty. Hoa Lu was chosen because of the large limestone mountains that provided a natural barrier to everything except mountain goats. The temples that were rebuilt are in honor of emperors Đinh Tiên Hoàng and Lê Đại Hành, their sons, and Queen Dương Vân Nga. I really appreciated all the detail they put into these temples. From the beautiful carved animals to the pillars and buddhist shrines. The tour took about two hours before we headed back in the van so we could see the Halong Bay of the Land- Tam Coc. Halong Bay is famous internationally for its dramatic limestone mountains. Just as beautiful lies an area south of Hanoi called Tam Coc. A river winds between tall limestone mountains and rice paddies. The first thing I noticed when we got out of the van was the boats lined haphazardly against the dock. The second thing was the mountains green and sharp against the skyline. We were paired with a rower and a life jacket before climbing into the boats. The trip was smooth and languorous which was surprising given the boats are rowed by their feet which eases the strain on their back. The boat goes along the Ngo Dong river and is 3km long. When I was looking up at those mountains I felt humbled by nature. 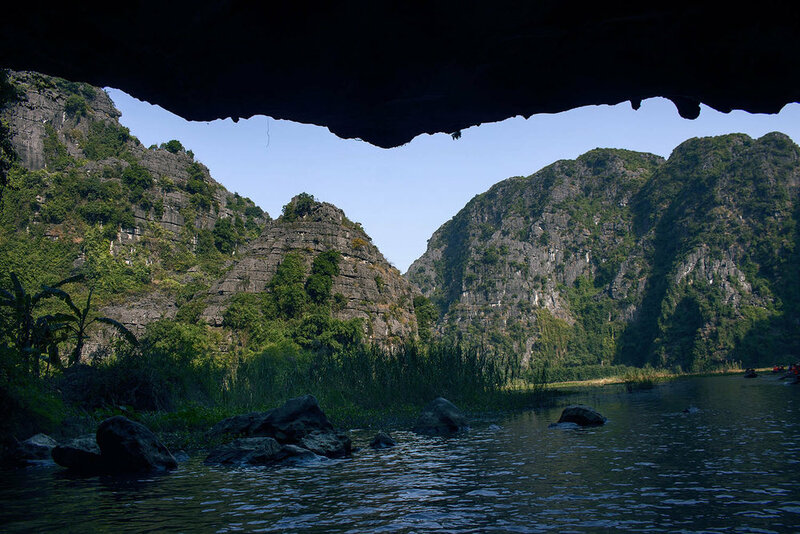 The trip takes you through three caves that have been created by the convergence of limestone and water. One of the caves had a ceiling so low I could reach up and touch it, the stone cold to my hands. I asked our guide when the best time to come is and he said right before the rice is harvested, because then the banks of the river are a sea of gold and green. Unfortunately the rice is harvested twice a year once during the blistering hot season and then once again in the rainy season- so I’ll never get to see it in all its glory. We ended our tour with a bike ride to see the mountains up close and see some burial grounds. Large bulls lay on the side of the road absorbing the setting sun as we biked along these dirt roads. When our tour concluded everyone got back on the bus and returned to Hanoi, I however stayed behind to continue south.